There is nothing like the arrival of a fresh, new season to lift our spirits and challenge us to re-evaluate our situation, re-think our goals and move forward in a positive direction. HomeLife continues to do just that. We offer you a real estate career with limitless potential. In order to serve our customers faster and our own sales team better we have developed an extensive network of HomeLife Web Sites. 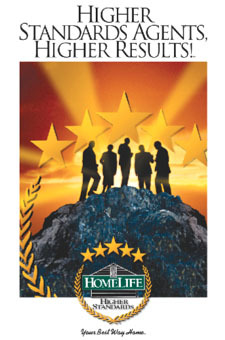 Our National Web Site at www.homelife.com currently experiences over half a million hits per day and contains a wealth of information for the prospective client. HomeLife provides more than just listing information however, from our sites clients can receive office profiles, realtor profiles, and in-depth community profiles city by city. They can click into Real Estate Trends for weekly up-dated information. Our members can also download the quarterly farming newsletter, HomeTime, which can be personalized. Also on-line are our company newsletters, and for the convenience of our members, we have provided an on-line Referral Service. HomeBase, HomeLife's Intranet, offers you a cost effective and time efficient method of acquiring all the essential information, products and services needed to insure increased productivity. Each year our members attend sales rallies and conventions where they have the opportunity to network, check out new products and services offered by our suppliers, listen to guest speakers and attend the gala awards ceremony.